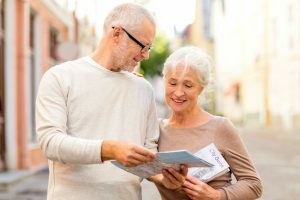 Senior adventure travel is a segment of the travel industry that is picking up steam. With more baby boomers sneaking into the senior category year by year, it is only going to get bigger. Senior adventure travel takes the participants into more dynamic activities that boldly stare the sedentary lifestyle in the eye and says no thank you. Here at Clearwater Beach to St Pete Beach area of Florida, we have plenty to keep an active person active. A few physically strenuous choices top the list. Kayaking and paddleboarding are options to get out onto the water. They are not for the meek, despite our calm waters. It is important to steer clear of other boaters and have a little endurance to offer. Horseback riding tours are available in the St Pete Beach area where you get to ride horses on the beach. If that’s on your bucket list, its actually very easy to achieve. On our soft white sands the experience is just that much better. For thrill seekers of any age we have plenty of Jet Ski rental outlets. Some rent directly from the surf of the beach. Few things are more exhilarating than jetting across the Gulf of Mexico with yourself at the controls. Perhaps the most dynamic activity of them all is paragliding. Sure, you are strapped into a harness where you simply hang from a parachute, but still, it’s not an activity for those accustomed to a sedentary existence. It is a fantastic way to get an aerial view of the Gulf. If you keep a sharp eye out you are bound to see dolphins and sea turtles. One unique option for a truly thrilling adventure is a flyover of the beach on a motorized kite glider. Tours are available, weather permitting, from a nearby municipal airport. If you want the most amazing views of the Florida Gulf Coast imaginable, this is one to look up. You are all but guaranteed views of dolphins, manatees, turtles, and more while you glide over the gorgeous white sand beaches. If this isn’t on your list of must-do activities, it should be. Not all adventures require physical strain. On our coastline, we have plenty of mild activities capable of creating cherished memories but which still rate as adventurous. Island hopping is one of the most sought after activities in our area. Not everyone gets to visit our outer islands. In fact, most people don’t. Setting your sights on our uninhabited islands is a great idea. Your means of travel will determine how much time you have. Tour boats will let you know how long you have on the island of your choice. The ferry to Caladesi Island gives you up to four hours, a fair amount of time at the beach. Private charter boats vary greatly on how long they will let you lounge. Those are the best because you can pick and choose your islands and visit more than one during an outing. Perhaps the most adventurous option of all is to rent your own boat to tour the area on your own. Until you have walked the shores of one of our uninhabited, white sand islands you have not truly experienced all that our area has to offer. The region surrounding Clearwater Beach, also known as the Tampa Bay Area, has plenty of river adventures. Kayaking, boating, and hiking our interior regions is a lot of fun. One of our most relaxing adventures might be to purchase a ride up one of our lazy Florida rivers. Most of them have a fun history lesson attached, which many boat captains will share with you. You will get to see natural Florida and quite often you will get to boat through a Florida swamp – without all the uncomfortable things that you would encounter on foot. When seen from a cozy seat on a river boat, Florida swamplands are actually quite beautiful. Regardless of the level of adventure you are seeking, Clearwater Beach and the surrounding coastal and interior areas have plenty for you, all within an hour or less of driving. And, when you are done with your excitement, the calm shoreline of the Gulf of Mexico is the perfect spot to relax.